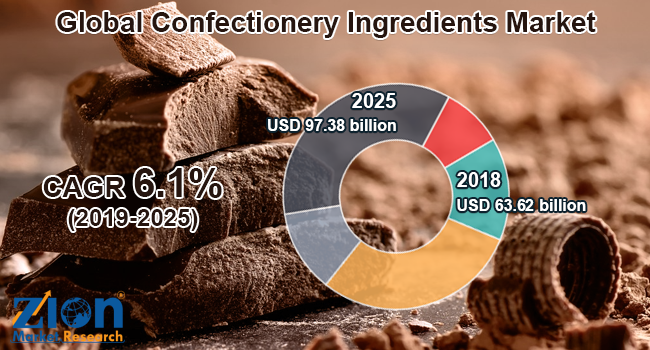 Global confectionery ingredients market expected to generate around USD 97.38 billion by 2025, at a CAGR of around 6.1% between 2019 and 2025. The growing number of health-conscious consumers and increasing preference for confectionery ingredients are expected to drive the global confectionery ingredients market over the forecast time period. The report encloses the forecast and current estimate for confectionery ingredients market on a global and regional force. The study provides historical data from 2016 to 2018 and the forecast period from 2019 to 2025 based on volume (Kilotons) and revenue (USD Billion). The study also provides the impact and the descriptive analysis of major drivers, restraints, and opportunities of the global confectionery ingredients market. The study also offers the market attractiveness and Porter’s Five Forces model analysis to gauge the competitive landscape of the major market vendors. This comprehensive study also provides a detailed analysis and an overview of each segment included in the study. The report concludes the major type, source, form, application, and region. All the segments have been analyzed based on present and future trends and the market is estimated from 2019 to 2025. The regional segment includes North America, Europe, Asia Pacific, Latin America, and the Middle East and Africa. Some key players operating in the global confectionery ingredients market include Barry Callebaut, Arla Foods, Archer Daniels Midland Company, E. I. du Pont de Nemours and Company, Kerry Group, Olam International, Koninklijke DSM N.V., Ingredion Incorporated, and Cargill, among others.